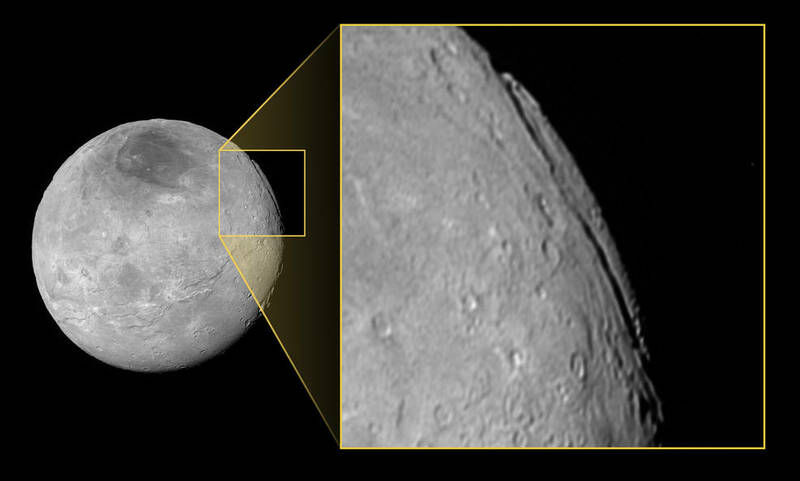 June 23, 2016 – Pluto’s largest moon, Charon, is home to an unusual canyon system that’s far longer and deeper than the Grand Canyon. The inset above magnifies a portion of the eastern limb in the global view of Charon at left, imaged by NASA’s New Horizons spacecraft several hours before its closest approach on July 14, 2015. A deep canyon informally named Argo Chasma is seen grazing the limb. The section of it seen here measures approximately 185 miles (300 kilometers) long. As far as New Horizons scientists can tell, Argo’s total length is approximately 430 miles (700 kilometers) long – for comparison, Arizona’s Grand Canyon is 280 miles (450 kilometers) long. At this fortuitous viewing angle the canyon is seen edge-on, and at the northern end of the canyon its depth can be easily gauged. Based on this and other images taken around the same time, New Horizons scientists estimate Argo Chasma to be as deep as 5.5 miles (9 kilometers), which is more than five times the depth of the Grand Canyon. There appear to be locations along the canyon’s length where sheer cliffs reaching several miles high occur, and which could potentially rival Verona Rupes on Uranus’ moon Miranda (which is at least 3 miles, or 5 kilometers, high) for the title of tallest known cliff face in the solar system. The image was obtained by New Horizons’ Long Range Reconnaissance Imager (LORRI) at a resolution of approximately 1.45 miles (2.33 kilometers) per pixel. It was taken at a range of approximately 289,000 miles (466,000 kilometers) from Charon, 9 hours and 22 minutes before New Horizons’ closest approach to Charon on July 14, 2015.